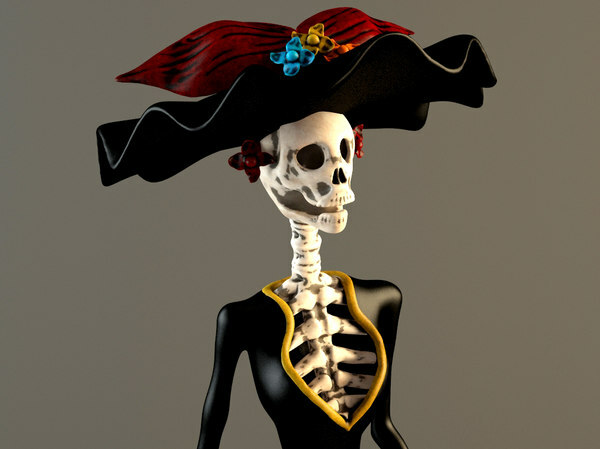 LONG BEFORE I even thought of moving to Mexico I was a fan of the Day of the Dead tradition. A Catrina stood on my bathroom counter in Houston. But that fascination played no role in my choice of a place to live. It was pure happenstance that I landed in one of Mexico’s major hot spots for the Day of the Dead. Even more good luck has found me living within walking distance of a generally excellent cemetery to visit on the Big Night. Being within walking distance is important because the traffic here on this day is a nightmare. So, after doing some chores in the morning, we had the Honda in the carport by noon, and did not drive outside again. Around 5 we took a walk to the neighborhood plaza for the heck of it, and we sat on a steel bench. 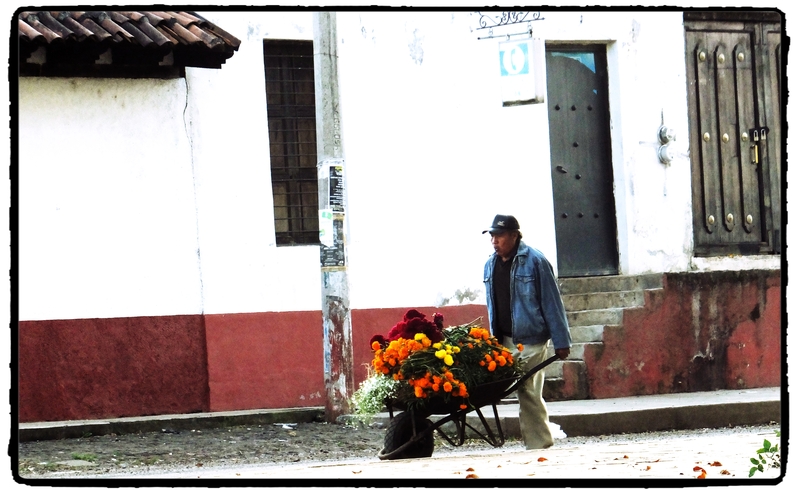 I shot the photo above of the man toting flowers to the nearby cemetery. I then pointed the camera in the other direction. As you can see, we had the plaza to ourselves because all of our neighbors were decorating graves in the cemetery. We’ve visited that cemetery most years on the night in question, and the experience has been variable. Sometimes it rains, making a muck of things. Some years, TV news crews have showed up with bright lights. One year, the municipality installed a huge spotlight on a high pole at the entrance, spoiling the atmosphere. But when it’s just right, it’s spectacular, a very moving and incredibly beautiful experience. We headed out just after 7 because night had fallen. We walked the two blocks to the plaza, which we crossed diagonally. We continued two more blocks. We crossed over the highway via a pedestrian walkway and looked down at the bumper-to-bumper traffic of clueless visitors heading elsewhere. Just a short walk farther was our huge neighborhood burial ground. I did not take a photo because thousands of other people have already done it for me. Here is one. As always, my child bride had built an altar in our living room. I photographed that later with my Fujifilm camera with no flash and with the living room lights off. We have lots of deceased on my wife’s side due to the large family and unexpected deaths. Her mother died at 31. Two brothers were murdered in unrelated incidents. I have got to get to Mexico some year soon at this time. Your plaza looks inviting. The photo of the altar with your new camera is really good. Angeline: This event is truly something to see. It’s amazing. 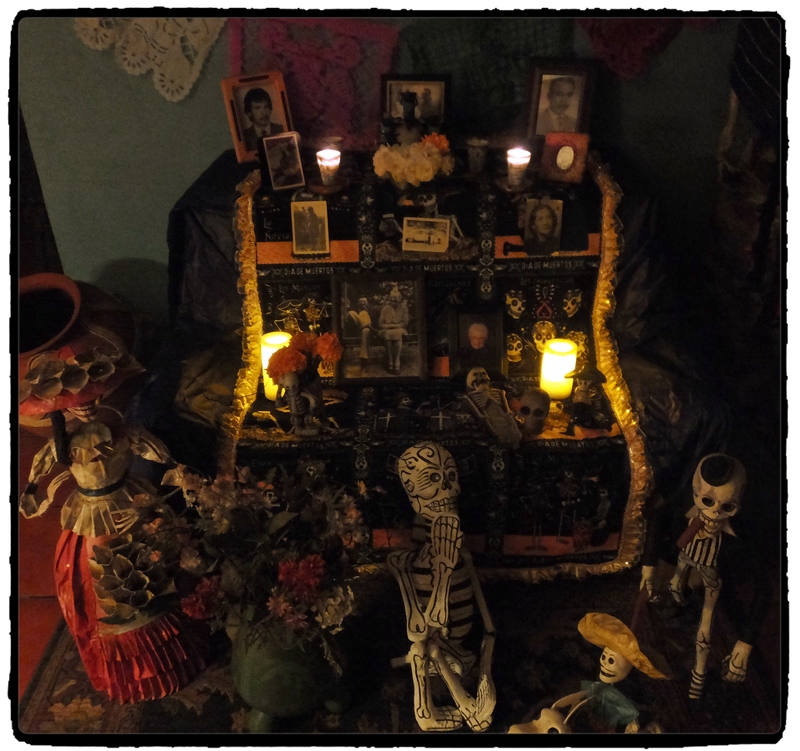 As for the altar photo, I was surprised. The Fujifilm camera does all manner of interesting tricks that even the pricier Canon doesn’t do. As I said, the living room lights were off, and I did not use the flash. Your cementery was perfect last night. The best experience we have ever had there. To add to the great experience we even ran into Steve Cotton. Patzman: Interesting. You must have gone later than we did. We wondered if we might run into ole Steve, but I knew his tour started at 8, and also I did not know if our burial ground was on his specific tour. Yep, it was a good night. Some years it isn’t, but this year it certainly was. Threatened rain in the afternoon, but it didn’t happen. The Goddess smiled on us. It was a great night. If I do it another time, I will drive. Señor Cotton: With few exceptions, I prefer having my car. We moved into the Hacienda over 13 years ago, and we’ve walked to our nearby cemetery on most, but not all, Muertos nights. I’ve never seen another cemetery do the event. I have seen photos, however, and, nice as it is, they pretty much all look alike. For that reason, I do not see the need to hit a bunch of cemeteries, a if-you’ve-seen-one-you’ve-seen-them-all type of thing. I feel the same way about Mexican Colonial cities. They are spectacular, but they’re spectacular mostly in the same way. And we visit the cemetery almost immediately after it gets dark, between 7 and 8 p.m. The effect is up and running, totally. So I also don’t see the need to be galivanting all over the place till 2 or 3 a.m., which is common, especially on organized tours. Others, many others, feel differently. But my way is more comfortable.